On April 7, 1889, American poet Walt Whitman and his friend Horace Traubel had this conversation. That’s what makes baseball beautiful. Not today’s games – of which there will be many – not yesterday’s – and not, especially, the one last night that the Orioles let get away (again). Not any one, but the sum total of them. The hurrah game. It’s who we are, isn’t it? Or, who we wish to be. 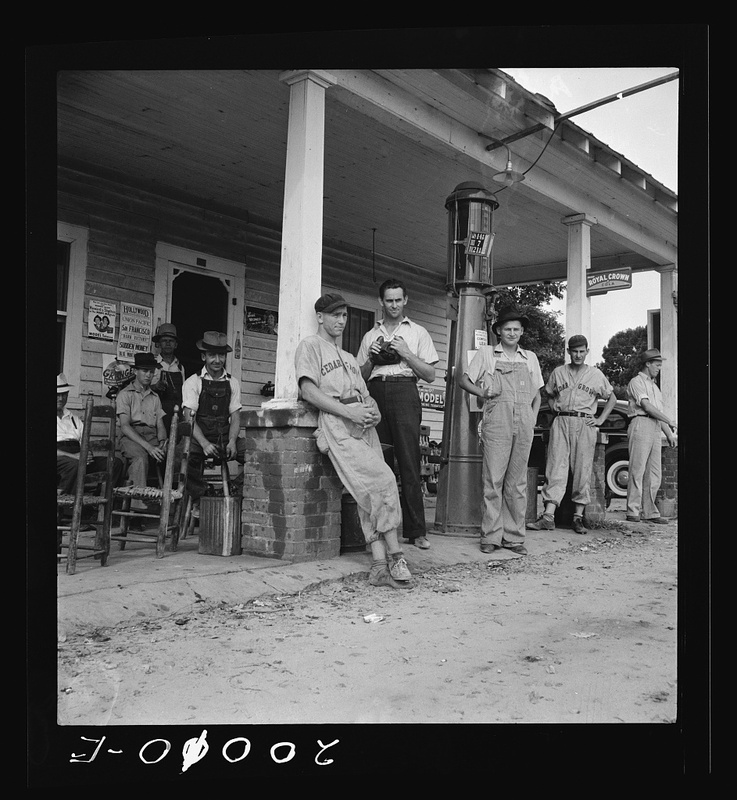 Dorthea Lange, the famed photographer who, better than anyone, documented the Great Depression, took this photo in Cedar Grove, North Carolina (about 20 miles north of Chapel Hill). The community center and men in baseball suits photo was taken by Lange on July 4, 1939. May your Fourth of July be hopeful. May there be a Hurrah Game for you. And, may your team, dressed in their best baseball suits, win. This entry was posted in Baseball, Baseball History and tagged baseball, Dorthea Lange, Fourth of July, Great Depression, Walt Whitman by Jackie, The Baseball Bloggess. Bookmark the permalink. A nice tribute to what I still regard as America’s National Pastime. Happy 4th of July! It did.. Red Sox 3, Nationals 0! Thanks for sharing this photo with us, Jackie. It epitomizes what a “lazy, hazy, crazy day of Summer” looks like. It’s such a beautiful photo — from the baseball players to the soda bottle in the player’s hand to the posters and ads tacked to the wall. There’s so much in that photo … it really does tell the story of the 4th of July in 1939, doesn’t it? Happy 4th, Jackie, on this “almost too hot to even play ball” day. Happy Independence Day! And justice draws near as it appears Nick Markakis will be elected to start the All Star Game (with more votes than Bryce Harper, and this year most deservedly so). Nick has emerged this year as leader of a team winning despite low expectations, a true professional, yet unafraid to challenge team management. Braves and Orioles fans have worked together to achieve this long-denied recognition for an exceptional star baseball player. Even in his younger, more athletic days he rarely dived and made those “OMG Play of the Day” catches. Why? Because he has the uncanny ability to be properly positioned and would make a difficult catch look easy. I always joked that Nick hated to get his uniform dirty. But, I think he has this ho-hum playing appearance which is simply a reflection of how good he is. I was going to boycott the All-Star game this year because a) the O’s are so stinky this season, and b) the game is in Washington as a punishment to Baltimore where it was supposed to be played. But, Nick overrides both those negatives. Yay! Hope you had a glorious 4th, Bloggess. Despite the all too familiar results today by the O’s, and the Twins, and even the Giants (who have shown some respectability), your post reminds me to consider the bigger picture. One of either the Yankees or the Red Sox will not play in the World Series. Possibly even both. Gotta take your Schadenfreude where you find it. 😁 And “Baseball is the hurrah game of the republic” is positively sublime. Thank-you! I had to reread this as some how this really resonated with me! I just had it swirling I, there and all I could think of was that tv show the Waltons! How life is a small snapshot best taken at a general store that has everything. And then baseball being interwoven into many of our lives. It stays, it becomes a part of you. Thank you and I sure hope your 5th brings a win for you. I find Dorthea Lange’s photos to be so beautiful and so evocative. She was such an extraordinary artist who documented an era, a culture, and a country so perfectly. And, that photo says so much. I keep watching that score box for you to appear on the left side! Beautiful artistry in her photos.